One game into the Cowboys’ season and one thing is abundantly clear: Dez Bryant needs to be mature and Miles Austin needs to be ready. As did the New York Giants last weekend, the Kansas City Chiefs this Sunday and the rest of the NFL the remainder of the season, defenses are going to focus their attention on Bryant. The Giants always had a safety lurking and a cornerback in front of Bryant, in what amounted to double-coverage. Bryant held his composure and managed his frustration during a minimally impactful four-catch night. The attention to Bryant and future Hall-of-Fame tight end Jason Witten spawns an obvious byproduct: Miles is open. Allowed single-coverage, Austin caught as many first downs as Bryant had total catches, and his 10 grabs were third-most on NFL’s opening weekend behind only Anquan Boldin and Andre Johnson. It was great to see Austin back. It’s imperative that his hamstrings remain healthy and his production stays aloft. And not a better place to continue the trend that back where it all started. 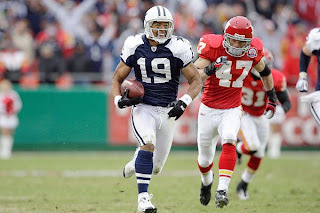 In 2009 Austin was the Cowboys’ third receiver until starter Roy Williams was injured entering Week 5 at Kansas City. So how did Austin respond in his first NFL start on Oct. 11, 2009? With a franchise record 250 yards on 10 catches and two touchdowns - most of them against now-Cowboys' corner Brandon Carr - including the 60-yarder in overtime that gave Dallas a 26-20 victory. Austin went on to catch 81 passes for 1,320 yards and 11 scores in making the Pro Bowl. And, it’s been all downhill since. Since that breakout game/season, he hasn’t approached 70 catches or caught more than seven touchdowns. His stats and impact yell third receiver, while the six-year, $57 million contract he received in 2010 screams elite No. 1. Against the Giants Austin seemed to have his first-step burst back. We know Bryant and Witten will get their catches. If the Cowboys are to exceed expectations, Miles Austin has to return to the days when he got his as well. Insightful....and you're right, the Cowboys need Austin to be a consistently healthy 1A to make the offense click and be able to make those clutch first down catches and the occasional game breaker when Dez is doubled. Harris, Beasley and eventually Terrance Williams are nice ancillary pieces in the offense, but none are quite ready to successfully fill that role in my opinion.